If u r a citrus lover u will sure enjoy this treat. Combine corn flour, sugar, lemon juice, Orange juice and water in a pan. Stir until nice & smooth & no lumps form to a quite thick mixture. Reduce heat and stir for 30 sec. Remove from heat whisk in egg yolks, butter & zest and then cool. In 6 individual ramekins fill in with lemon mixture. Beat egg whites on high with an electric beater until soft peaks form gradually add sugar in intervals beat until dissolved approx 5-7 min. 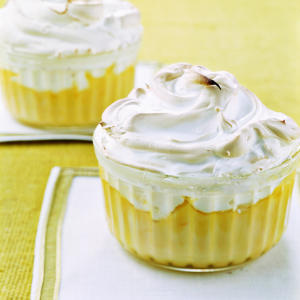 Now top the lemon mixture with your meringue then sprinkle with little sugar and bake for 5 min or until the top is lightly browned. Stand 5 min then serve. Hi Rabz, Could you please kindly let me know the baking temperature, whether in an oven or a microwave? Hi Vicky, To ur query we make it to the top by hard work .Plz check my profile, Only few of my recipes are at the top, most have only 1 or two votes which does not bother me at all. And if some r worried about some of my recipes being in the popular list then ask the viewers. I must inform u that nothing stays for ever, today I might have a recipe at the top after few days it will be someone else. This is life. These things never stay for ever and this is only KK not like I have made it to the genuineness book of records.Hope u got my point and be happy for others so that u can make it to the top too one day. How do some of you always make it to the top? Thank you Ritika & christy and thank christy for letting Ritika know. Thanks christy for clarifying my doubt. Hi rabz!,yummy recipe indeed.Hi Ritika!,Lemon zest, is also known as citrus peel, is a food ingredient that is prepared by scraping or cutting from the outer-skin of citrus fruits . Zest is used to add flavor ("zest") to foods. looks yummy ! vl try it. could u pls tell me , what is lemon zest?